So I once got this query for this book that sounded amazing. And I requested maybe the first 75 or 100 pages. Which was kind of a lot for me back then. These days I tend to request a little more up front but some other time I’ll get into my whole “request system” and what the numbers mean. For now I’ll just tell you they mean basically nothing, but they could mean something. Huh? Oh, right. I’m on Michelle’s blog! Of course that made no sense. Suffice it to say, that when I saw I had requested 100 pages (because let’s say it was 100 so the story sounds even better), I knew I had thought the query sounded really good, and so I was extra excited to read it. It’s really an incredibly brilliant query requesting pages system, if I do say so myself. Which I guess I am. Since it’s my blog and all. But I will admit, that there is a slight problem with my reading of the partials system. That’s probably another post for another time too, in fact, another series of posts for another time (like never), but for now I’ll just get back to this particular requested partial. I feel like that was sort of an annoyed sounding anyway as if you were the ones who keep interrupting me. But you’re not. ANYWAY, my requested but unread partials had gotten like crazy out of control due to personal matters which will not be disussed on the blog (henceforth (I really wanted to use the word heretofore but that means before now and I really needed a fancy word that meant from this point forward) to be called That Which Shall Not Be Named), so I decided to close to queries until I had a chance to catch up. I thought it would take a few weeks. But due to the heretofore (HA!! Slipped it in!) mentioned That Which Shall Not Be Named, it took me about 8 months I think. But I persevered, and I wrote the most gorgeous apologies and rejection letters known to mankind. By the time I got to the very last one, I was so relieved to be done, I opened it with equal parts joy and dread. I must admit I cringed a little at the fact that it was just over a year since the author had sent it to me. Now my plan was to make that “just over a year” in wingdings font or in very teeny tiny font, but since I still haven’t figured out how to change the font on my blog, you must all witness my shame in full fontal view. Anyway, I read the first 100 pages in about 1 minute it seemed and I was STUNNED. I emailed the writer ASAP and said, I know I’ve been an idiot, but if it’s at all possible that you haven’t been snapped up by another agent, could I possibly see the full manuscript? And so this wonderful woman said that after a lot of feedback from people she was just about finished with a major revision and could I wait a month or 2? Ok, so I waited, and in the meantime I fell so madly in love with this author–both as a person and a writer. We emailed, I wooed her, I basically made her fall in love with me so that she wouldn’t sign with any other agent when the time came. What can I say about this book? There have been so many times when I have referenced this story in real life conversations with people or taken this authors words from emails or phone conversations and applied them to my own life. She is wise beyond her years and truly one of the most special people I know, and it comes across in every word that she writes. Her amazing editor Anica Rissi has only made this incredible book even better. And I CAN’T WAIT until we can share it with you. But that’s not until next fall, sorry. Ha ha, just kidding!! 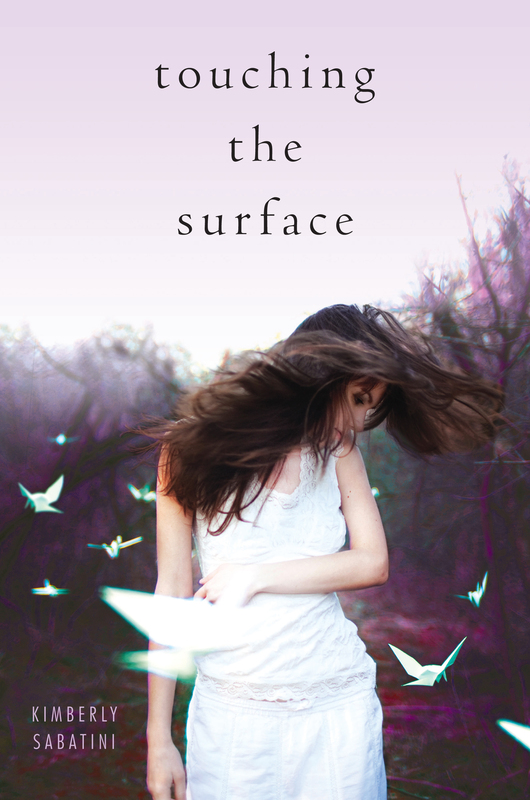 I’m so excited to show you the gorgeous cover for TOUCHING THE SURFACE by Kimberly Sabatini, out next fall from Simon Pulse. I LOVE this book. I LOVE Kim. And I know you will too. As she pieces together the mistakes of her past, Elliot must earn the forgiveness of her best friend and reveal the truth about herself to the two boys she loves…even if it means losing them both forever. Now go tell Kim (and me) how much you love it in the comments!!! And follow Kim on Twitter if you aren’t already @kimsabatini. OMG!!!! I LOVE it!! And I loved Touching the Surface too! And I’m soooo happy to see the cover!! YAY!! Oh wow! That’s… wow! I’m very glad you two found each other and after reading the summary, I’m really intrigued by this story’s premise! Thanks for introducing us to Kim. I’m excited to get to know her through TOUCHING THE SURFACE. This is truly a stunning cover. As I told Kim in an email, that purple reminds me of the purple in a sunset…everything about the cover is gorgeous. Loved hearing all these juicy behind-the-scenes details! Thank you for sharing! HUGE congrats and good wishes to you both!!! Really enjoyed this blog post. Found it very interesting, would love to hear more about your query thought processes. The cover is really pretty too. I saw the cover last night and was in awe. I love it so much. I love movement in a cover and it has so much, from the hair to the birds. Lots of love for this cover I can’t wait to read it and I’m feeling a bit smug that I might get to read it a little early. As in an ARC (hint, hint). 🙂 Congrats to both of you on a beautiful cover. That is beautiful. Very haunting. And I like the “….people’s she’s killed.” Who did she kill? Guess I’ll have to read the book to find out! I can’t wait to read this! Also, Michelle, your blogging style FTW. LOVE. This is my favorite kind of post. I love to hear how people get their agents AND I love to see book covers. Throw in some of Ms. Wolfson’s musings… it’s a win/win situation. Can’t wait to read it! I do so LOVE that cover. And Kim. And her editor. And I’m also fond of you. Thus, this whole thing is a home run as far as I’m concerned. I love this cover and love Kim, too! So happy for you both. Wow, what a cover!! Love it! Michelle, you are a total crack up (and I love your use of parentheticals [especially since I tend to use them a lot, too]). And I have to say, I’m a bit jealous of the Wolf Pack. The more members I get to know (Kiersten, Kasie, Stephanie, and now Kim) the cooler it seems. Beautiful cover, story sounds original and amazing. Congrats on the long road to publishdom! I have a little bald spot in the back of my hair from twirling and twirling–*whistling*–being polite and waiting through your story to get to the real story *SNERT*!!! You’re a crack up! I esp. loved this line: “We emailed, I wooed her, I basically made her fall in love with me so that she wouldn’t sign with any other agent when the time came.” AWWW! Of course I follow Kim (and you) on Twitter and her cover is just beautiful! Looking forward to this book! I absolutely love the cover and can’t wait to read this amazing book! Huge congrats to you and Kim. I know Touching the Surface will be a huge hit, and can’t wait to fight my daughters for the first read the second it’s released. Also, gorgeous cover! The book sounds amazing too. How many times have I said how much I love this cover? NOT ENOUGH!!! It’s awesome, you’re awesome, and September is too far away. I want to read it! Such a pretty cover! Thanks for all your awesome comments. Wait until you read this book!!! You are the best Tinkerbell Ninja Agent evah! Oh, man. I want, want, WANT this book! What a gorgeous cover, and such a cool concept. Gimme!